The truth of the matter, I, like so many others have listened to Claude-Michel Schönberg and Alain Boublil's score and libretto based upon the 1862 novel by Victor Hugo, countless times. Have seen it staged at least twice. Yet, it's hard to believe it was 1987 that Les Misérables hit Broadway! A Movie Musical adaptation was long since due. And I'm happy to report it met my criteria for what I hoped the film version would be. Listening to the Les Miz CD so often, desensitized me to the emotional impact of the story and characters. Oftentimes when listening to just the score, I couldn't even remember exactly what was taking place in each scene. Now having seen the movie, it brings the whole tale into a much more vibrant light, allowing me to be more in tune (no pun intended) with the characters than I ever was seeing it on stage or hearing the recording. And example of this added poignancy can be found in the only new song written expressly for the film. 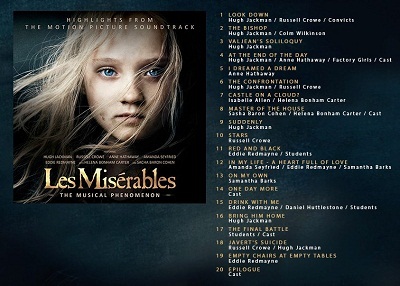 The song “Suddenly” was added because there needed to be a moment of reflection after Jean Valjean (Hugh Jackman) “adopts” little Cosette (Isabelle Allen/Amanda Seyfried). So true, this role was made for Jackman. He's always had the versatile quality of being a hero/anti-hero and a Broadway showman. The role of Jean Valjean allows him to seamlessly blend these two sides of his talent together perfectly. 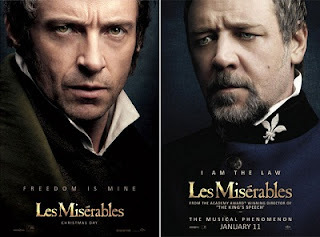 Unfortunately, Russell Crowe as Detective Javert, does not hold up his end as the perfect nemesis to tangle with Jackman's Valjean. I wanna go back to the music of Les Misérables for a moment. The most significant thing about this production, brought up again, and again, is the fact that the performers did all their singing on set, while shooting in character; not sung in a studio and then lip synched for film. I do recall Barbra Streisand saying this is the way she prefers to do a musical and did so for at least some of the songs for Funny Girl and I believe Yentl. But with the advent of digital imaging which allows the filmmaker to easily remove microphones and boom mikes out of the scene in post production, this may become the standard way of directing a movie musical. Here's a segment from 60 Minutes that goes into more detail. The look of Les Misérables – The opening scenes have a gritty, sad, almost nightmarish quality, then as we move on to the scenes after Jean Valjean has been released from prison, the filming has a more sweeping, epic, BBC realism. But by the time we get to Fantine (Anne Hathaway) selling her, teeth, hair and hope in the streets “Lovely Lady”, the production is filmed on an elaborate sound stage, creating a Fantasy/Broadway look. The rest of the film more or less stays this way. I kinda wish we never saw Valjean walking across the mountains, unless the movie intended to film on actual locations for most of the shoot. I suppose the only Food in Film reference would be where the story's levity has always been found - the greedy, swindling Inn Keepers -The Thénardiers. 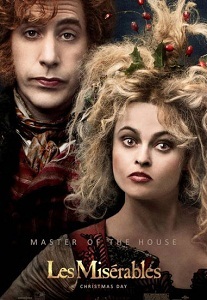 Played with central casting perfection by Sacha Baron Cohen & Helena Bonham Carter. The Inn has some Sweeney Todd type action happening in terms of food service. 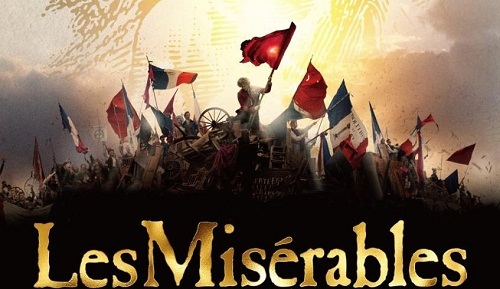 Also for a bit of fun, here's a "Les Miserables" lyrics quiz: Play Quiz: The Lyrics of "Les Miserables" now! To play, chose the song lyrics which immediately precede the lyrics asked in the question (multiple choice).